2. Sifu Phil Ng shattering the bricks with a hammer fist. 7. Sensei Greg Schomburg about to toss Sifu Phil on his head. 3. 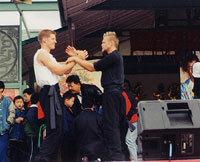 Eric Biedermann and Crazy Jon Hoehn engage in a chi-sao demonstration. 8. A group photo taken before the moon festival celebration. 4. Instructor Henry Kwok and Instructor Keith Voney lead the chi-sao demonstration. 9. Ready to begin the performance. 5. Instructor Keith and Instructor Henry engage in lap-sao. 10. Members of the Ng Family Chinese Martial Arts Association.